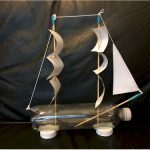 This Recycled Bottle People Craft is easy for little ones to create. They can make them to look like themselves or completely out of this world. Cut circles out of construction paper for the puppet faces. Use markers, crayons or colored pencils to draw on facial features. Cut out felt or fabric scraps for clothing and glue on the bottle. Hair can be fashioned out of thin strips of paper or yarn. Arms and legs are made of accordion folded paper strips.